Nick Davila sweeps a dark lock of curly hair away from his face and flashes a giant grin just thinking about it. It was a little more than 11/2 years ago. Only nine days separated the mid-November meeting of the University of Cincinnati Bearcats and Rutgers Scarlet Knights. The Spokane Shock quarterback and his Cincinnati teammates watched as undefeated Rutgers knocked off the then third-ranked Louisville Cardinals. It was Big East Conference play in 2006, and as the senior observed the Scarlet Knights’ wild celebration via television, he didn’t know for sure what his role would be when his Bearcats faced them the following week. Two days later, the Bearcats lost at West Virginia. When starter Dustin Grutza suffered an injury late in the game, Davila was called in for replacement duty. Things continued to fall into place as the week went on. Davila got the official notice midweek that he would go from understudy to a starring role and make his first start in his final home game as a Bearcat. His parents Fernando and Marsha – a construction foreman and teacher – and his four younger sisters and brother made the trip and were in the Cincinnati stands for the first time. They had planned the trip months before because the game was on senior night. “It just worked out, ‘timing-wise,’ ” Davila said. But it turned into more than that. After he fumbled the first snap of the game, Davila completed 11 of 15 passes for 277 yards and led the Bearcats to a 30-11 upset over the seventh-ranked Scarlet Knights. “It was a picture-perfect scenario,” Davila said. “It just happened to work out. I just went in and played like I was back in the backyard having fun. That’s the thing my dad taught me. I’d come home from school, do my homework, and he’d come in covered in dirt, after a hard day of work, and we would go outside and take batting practice until it got dark. Davila, 23, hasn’t stopped doing so. Born and raised in an east suburb of Los Angeles, the two-sport standout in high school ultimately chose football over baseball for love of the game. Before he ended up at Cincinnati for two years, Davila was a two-time All-American at Chaffey Community College in Southern California. His initial plans didn’t include junior college, but a day after accepting a scholarship offer to play for Dennis Erickson at Oregon State (Erickson left the next year anyway), Davila broke his collarbone and eventually decided to go where scholarship money was available. The tide lowered during his second year at Chaffey when his grandmother lost her battle with breast cancer. “I went to her funeral in the morning and played a football game that day,” Davila said. “It was real hard, but I wanted to win for her and we did. It felt good, but it was bittersweet, big time. I think about it, and if I wouldn’t have had my brother and sisters and parents there I would have been a nut case. She was also the catalyst for Davila’s participation in Locks for Love, a charity that gives hair to cancer patients. Davila has let his hair grow up to 11 inches in the three times he’s donated his tresses to the organization. “Someone did it for my grandma, so I want to do it for others,” Davila said. Flash forward to now, where Davila has quickly made the transition to arena football. 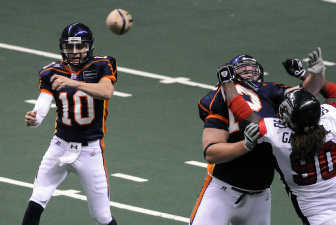 The left-handed rookie took over the starting position for the top-ranked and West Division-champion Shock (12-1) in the sixth game of the season and is second in the arenafootball2 league in pass-completion percentage (68.2), third in pass efficiency (120.4 – .2 behind 2006 ArenaCup champion Shock quarterback Kyle Rowley) and fifth in yards per play (7.4). In the Shock’s division-clinching victory over Central Valley two weeks ago, Davila set single-game franchise records for passing yards (367), pass attempts (50) and pass completions (34) while throwing six touchdown passes and rushing for two more. “I think he’ll get a great shot next year in the AFL,” said Shock coach Adam Shackleford. “He’s got a calm demeanor, nothing seems to rattle him, and he makes plays. He throws early. He makes quick decisions. He throws accurately, and doesn’t take chances with the football.